We are a clinical stage biopharmaceutical company advancing a robust pipeline of drug candidates to address a spectrum of large, unmet medical needs. We are focused on harnessing powerful, untapped biology underlying major diseases to develop transformative therapeutics for patients. We are intensely science-driven and committed to having a profound impact on addressing some of today’s most urgent medical needs. We are leveraging our biology-centric drug discovery approach to uncover novel mechanisms of action and generate proprietary insights that will enable us to move rapidly into proof-of-concept studies and deliver first-in-class medicines. We aspire to operate one of the most productive research and development engines in the biopharmaceutical industry, with multiple programs already in clinical development. Our initial areas of focus include cardio-metabolic, liver, oncologic and ophthalmic diseases. But we are not limited to the therapeutic areas we can explore. We intend to continue growing our pipeline of experimental medicines and building our proficiency in discovery research. Our management team, scientists, board members and advisors have extensive track records of successfully discovering, developing and delivering to patients multiple, class-defining drugs with meaningful clinical and commercial impact, which positions us well to maximize the potential of our drug discovery approach. Mr. Rieflin became Executive Chairman of NGM’s Board of Directors in September 2018, after having served as Chief Executive Officer of the company and a member of the Board over the prior eight years. Prior to joining NGM, he was President of XenoPort, Inc. (NASDAQ: XNPT), which was acquired by Arbor Pharmaceuticals in 2016, and Executive Vice President, Administration, Chief Financial Officer, General Counsel and Secretary for Tularik Inc. (NASDAQ: TLRK), which was acquired by Amgen Inc. in 2004. Previously, he was Vice President, Human Resources, General Counsel and Secretary for AMSCO International, Inc. (NYSE: ASZ). He was also an associate at Sidley & Austin in the corporate and securities department. He began his career as a sales representative for American Hospital Supply Corporation. He currently serves on the Board of Directors of FLX Bio, Inc. and Kallyope, Inc. Mr. Rieflin earned his B.S. from Cornell University, his M.B.A. from the University of Chicago Booth School of Business and his J.D. from Stanford Law School. Dr. Woodhouse became Chief Executive Officer and a member of NGM’s board of directors in September 2018 and has served as our Chief Financial Officer since March 2015. From 2002 to 2015, he was an investment banker at Goldman Sachs & Co. LLC, most recently as a Managing Director in the healthcare investment banking group and co-head of biotechnology investment banking. Earlier in his career, Dr. Woodhouse worked at Dynavax Technologies and also as a research assistant at Amgen, Inc. Dr. Woodhouse received a B.A. in pharmacology from the University of California, Santa Barbara, an M.B.A. from the Tuck School of Business at Dartmouth and a Ph.D. in molecular pharmacology from Stanford University School of Medicine. Dr. Trombley became President and Chief Operating Officer in September 2018 and has served as our Chief Operating Officer since June 2015. Prior to that, Dr. Trombley was head of Business Development between 2011 and 2015. She was most recently at Novartis in Basel, Switzerland, where she was Chief of Staff for the Chief Executive Officer and worked on key corporate initiatives and strategic projects across the company’s healthcare businesses. Earlier in her career, Dr. Trombley worked at XenoPort, Inc., and at McKinsey & Company, where she advised pharmaceutical and medical device clients on strategic, commercial and operational issues. Dr. Trombley has served as a director of Carmot Therapeutics, Inc. since 2016. She received a B.S. in Chemistry from the University of California, San Diego and a Ph.D. in Chemistry from MIT. Dr. Chen is NGM’s Founder and has served as a member of our board of directors and as Chief Scientific Officer since January 2008. He was also NGM’s President until November 2014. Previously, Dr. Chen held various positions at Amgen, most recently as its Vice President, Metabolic Disorders, with responsibility for leading the company’s global research efforts in small molecule and biologic drug discovery for the treatment of human diseases affecting metabolism, bone, mineral balance and muscle. Prior to joining Amgen, he served as Vice President of Biology at Tularik where he guided drug discovery research in oncology, inflammation and metabolic disease. Dr. Chen’s pioneering work on a broad array of targets at both Amgen and Tularik not only opened up opportunities to study new aspects of biology and physiology across disease areas, but also led to contributions of multiple drug candidates to the development pipelines of these organizations, including RepathaTM (evolocumab), a novel anti-PCSK9 antibody that lowers low-density lipoprotein cholesterol. Dr. Chen received a B.S. in Nutrition and Food Science from Fu-Jen Catholic University, and a M.S. in biochemistry from National Taiwan University. He completed his graduate training at the University of California, Berkeley in 1994, receiving a Ph.D. for his research on the mechanisms of transcription carried out in the laboratory of Prof. Robert Tjian. Prior to his current role as NGM’s Chief Translational Officer, Dr. DePaoli served as NGM’s founding Chief Medical Officer (CMO). Before joining NGM in 2010, Dr. DePaoli was CMO at IntreKin Therapeutics. In this role he oversaw global development of INT131, a PPAR-gamma modulator, through a successful End of Phase 2 meeting with the FDA. He brings to NGM more than 20 years of experience as a clinician and translational researcher in diabetes, obesity and metabolic disease. Dr. DePaoli trained in Clinical and Molecular Endocrinology at the University of Chicago and in the Howard Hughes laboratory of Dr. Graham Bell. His clinical and translational research interests in diabetes and obesity were focused during his work at the Sansum Diabetes Research Institute which led him to join Amgen in 1998 to champion the development of their cardiometabolic disease portfolio. His work at Amgen was pivotal in enabling multiple clinical applications of the adipocytokine leptin (Myalept). At Amgen, he also led a broad array of cardiometabolic, muscle and bone programs with a focus on translating novel pathways into the clinic. These pathways included: RANK Ligand (now Prolia and Xgeva), PCSK9 (Evolocumab), 11 Beta HSD-1, Myostatin, IL-1 receptor, Calcium Sensing Receptor (Sensipar), PPAR-gamma modulation, DPP-4 and MCH-R1. Dr. DePaoli also maintains a clinical endocrinology practice at the William Sansum Diabetes Center. Dr. Learned joined NGM as Director of Research Operations in January 2008, providing strategic and operational support for our research efforts. Formerly a Director of Research in Metabolic Disorders at Amgen, he led in vivo pharmacology for several programs and played a significant operational role in the department. Previously, he was part of the Lead Discovery group at Tularik and was central to the identification and optimization of lead compounds for multiple projects in the diabetes and obesity programs, including several candidates selected for human clinical studies. Dr. Learned graduated from the University of California, Los Angeles with a B.S. in Biochemistry and received a Ph.D. in biochemistry from the University of California, Berkeley. He completed post-doctoral training at the Whitehead Institute for Biomedical Research, and subsequently served as an Assistant Professor in the Department of Biochemistry at the University of California, Davis. Dr. Lieu joined NGM in March 2019 and brings more than 15 years of experience leading clinical development programs and executing integrated medical and commercial strategies across a spectrum of therapeutic areas. In both large pharmaceutical and biotechnology companies, Dr. Lieu has led teams responsible for preclinical through phase 3 development, as well as medical affairs. Prior to NGM, Dr. Lieu worked at Genentech as Vice President of Early Clinical Development for all non-oncology molecules. He also worked at Eli Lilly, where he held various leadership roles, including Global Brand Development Leader for Taltz®, Managing Director and Vice President at Lilly’s internal early clinical development and research division Chorus , Head of Global Clinical Pharmacology for diabetes, and Senior Medical Director of U.S. Medical Affairs for a number of cardiovascular and autoimmune products. Prior to joining Lilly, Dr. Lieu was a co-founder and CEO of RetinoRx, LLC and Chief Medical Officer/Executive Vice President at Niles Therapeutics, Inc. Earlier in his career, he held clinical development leadership roles with Portola Pharmaceuticals, Inc. and CV Therapeutics, Inc. (acquired by Gilead). Dr. Lieu was an attending cardiologist at San Francisco General Hospital from 2002-2013 and an adjunct Associate Clinical Medical Professor at University of California, San Francsico (UCSF). He completed his cardiology fellowship at UCSF, a postdoctoral research fellowship in molecular cardiology at the J. David Gladstone Research Institute at UCSF, and an internal medicine residency at Columbia Presbyterian Hospital. Dr. Lieu received his M.D. from Albert Einstein College of Medicine and B.A. from New York University. Dr. Shen is a leading expert with more than 20 years of experience in the antibody and therapeutic protein field. He has a proven record of advancing pipelines from discovery to proof-of-concept in clinical stage to registration. Before joining NGM in 2013, Dr. Shen served as Vice President, Global Head of Biologics Development at TEVA Pharmaceuticals and managed the innovative biologics, biobetters and biosimilars portfolio across therapeutic areas. During his tenure, several biologics/biosimilars were successfully approved, including TBO-Filgrastim by FDA and Lipegfilgrastim by EMA. Prior to TEVA, Dr. Shen was Executive Director, Biologics Research and GlycoFi at Merck where he oversaw overall biologics pipeline from discovery to preclinical development. His professional career started at Amgen where he held positions of increasing responsibility, including site-head for the Protein Sciences Department in San Francisco, and was critical in advancing more than eight antibody drug candidates from research to clinical development and regulatory approval, including evolucumab (anti-PCSK9), romosozumab (anti-sclerostin) and denosumab (anti-RANKL). In addition, he has developed the mammalian full IgG display technology that is now widely used by the antibody field. Dr. Shen graduated from East China University of Science and Technology and received a Ph.D. from University of Toronto. He completed post-doctoral training at the Whitehead Institute for Biomedical Research. Dr. Tian joined NGM in January 2008, providing leadership for our discovery research efforts. He was most recently the Scientific Director in the Metabolic Disorders Therapeutic Area at Amgen, responsible for early stage discovery research in the area of diabetes and lipid disorders. Prior to Amgen, he was responsible for the orphan G protein-coupled receptor drug discovery program at Tularik, successfully leading several projects in multiple therapeutic areas, including metabolic disease, inflammation and neurodegenerative disorders. During the course of these efforts, Dr. Tian and his team identified several clinical candidates for study in humans. Dr. Tian received a Ph.D. in Molecular and Cellular Biology at the University of Texas Southwestern Medical Center and completed post-doctoral training in Developmental Biology at Harvard University. Mr. Rieflin became Executive Chairman of NGM’s Board of Directors in September 2018, after having served as Chief Executive Officer of NGM and a member of the Board over the prior eight years. Prior to joining NGM, he was President of XenoPort, Inc. (NASDAQ: XNPT), which was acquired by Arbor Pharmaceuticals in 2016, and Executive Vice President, Administration, Chief Financial Officer, General Counsel and Secretary for Tularik Inc. (NASDAQ: TLRK), which was acquired by Amgen Inc. in 2004. Previously, he was Vice President, Human Resources, General Counsel and Secretary for AMSCO International, Inc. (NYSE: ASZ). He was also an associate at Sidley & Austin in the corporate and securities department. He began his career as a sales representative for American Hospital Supply Corporation. He currently serves on the Board of Directors of FLX Bio, Inc. and Kallyope, Inc. Mr. Rieflin earned his B.S. from Cornell University, his M.B.A. from the University of Chicago Booth School of Business and his J.D. from Stanford Law School. Dr. Goeddel became lead independent director of NGM’s board of directors in September 2018 has served as chairman of our board of directors since January 2008 and served as our Chief Executive Officer from 2008 to 2010. Dr. Goeddel has been a Managing Partner of The Column Group, or TCG, a venture capital partnership, since 2007. Dr. Goeddel co-founded Tularik in November 1991, was Vice President of Research until 1996 and Chief Executive Officer from 1996 through 2004. He served as Amgen’s first Senior Scientific Vice President until May 2006. Prior to Tularik, he was the first scientist hired by Genentech, and from 1978 to 1993 served in various positions, including Fellow, Staff Scientist and Director of Molecular Biology. He is a member of the National Academy of Sciences and the American Academy of Arts and Sciences. Dr. Goeddel received a B.S. in Chemistry from the University of California, San Diego and a Ph.D. from the University of Colorado. Ms. Hooper has served as a member of our board of directors since August 2018. Since March 2012, Ms. Hooper has served as the Executive Vice President and General Counsel of Jazz Pharmaceuticals plc. From 1999 until February 2012, she was a partner in the law firm Cooley LLP. Ms. Hooper received a J.D. from the University of California, Berkeley, Boalt Hall School of Law and a B.A. in Political Science from the University of California, Santa Barbara. Mr. Leschly has served as a member of our board of directors since January 2008. Mr. Leschly is a Managing Partner of Rho Capital Partners, an investment and venture capital management company. He has twenty years of experience in the venture capital and private equity business. Prior to joining Rho in 1999, he spent five years at Healthcare Ventures where he was a general partner. Previously, he had several years of management consulting experience at McKinsey & Company. In addition to a number of private company boards, his current and former board involvement in life sciences and healthcare includes: Anacor Pharmaceuticals, Gloucester Pharmaceuticals, Memory Pharmaceuticals, MPV, NitroMed, Senomyx, Tercica, Vanda Pharmaceuticals, Verenium (formerly Diversa) and Vicuron. Mr. Leschly received an A.B. from Harvard University and an M.B.A. from the Stanford Graduate School of Business. Dr. Schnell has served as a member of our board of directors since January 2008. Dr. Schnell is a Managing Director and co-founder of Prospect Venture Partners, a series of dedicated life science venture capital funds with over a $1 billion under management since inception. Dr. Schnell has been actively involved in the formation and growth of numerous successful biomedical and health care companies. He currently serves on the Board of Directors of several private companies, and has served on the boards of Amira Pharmaceuticals (NYSE: BMS acquired), Gloucester Pharmaceuticals (NASDAQ:CELG acquired), Healtheon (NASDAQ: WBMD), Kythera Biopharmaceuticals (NASDAQ: KYTH), Microcide (NASDAQ:MCDE), Neurocrine (NASDAQ:NBIX), Rinat Neuroscience (NYSE:PFE acquired), Senomyx (NASDAQ:SNMX) and Trubion (NYSE: EBS acquired), among others. Dr. Schnell received an M.D. from Harvard Medical School, an M.A. in Health Services Research from Stanford University School of Medicine and a B.S. in Biological Sciences from Stanford University. Mr. Svennilson has served as a member of our board of directors since January 2008. Mr. Svennilson has twenty-nine years of experience in corporate finance, investment banking and venture capital. He is the Founder and Managing Partner of The Column Group, an early-stage venture capital group that has started or invested in approximately 16 biotech companies and manages funds totaling approximately $600 million. Mr. Svennilson was previously the founder and a partner of Three Crowns Capital, a backer of a new generation of U.S. biotechnology companies. Prior to Three Crowns Capital, he was the Associate Managing Director in charge of European Investment Banking Origination at Nomura Securities in London. He helped found companies like Rosetta, PTC, Tercica and Somalogic, and has helped finance and develop biotech companies such as Tularik, Sunesis, ChemoCentryx, Infinity, AVEO, Rinat and FivePrime. He is currently a member of the Board of Directors of Gritstone Oncology, Inc., ORIC Pharmaceuticals, Inc. and Immune Design Corp. and has previously served on boards of several other biotechnology companies including Aragon, Seragon, Rosetta, PTC, Somalogic and ChemoCentryx. Mr. Svennilson is currently a Trustee for The Institute for Advanced Study in Princeton, New Jersey. Mr. Svennilson earned an M.B.A. from the Stockholm School of Economics. McHenry (Mac) T. Tichenor, Jr.
Mr. Tichenor has served as a member of our board of directors since March 2010. Mr. Tichenor is a private investor, entrepreneur and philanthropist with broad experience in managing and growing successful businesses. Mr. Tichenor served as President, Chief Executive Officer and Director of Tichenor Media System, Inc., which he subsequently merged with the Hispanic Broadcasting Corporation and, ultimately, with Univision Communications. He has also served as a director of several public companies. Mr. Tichenor is currently Executive Director of WWWW Foundation (Quad W), a non-profit organization devoted, in part, to cancer research. He served as Chairman of the Board of the Sarcoma Alliance for Research through Collaboration, a non-profit sponsor of clinical trials for the prevention, treatment and cure of sarcomas. He is active on various boards associated with The University of Texas, including the Chancellor’s Council Executive Committee, the Advisory Council of the McCombs School of Business, the MD Anderson Cancer Center Board of Visitors and the Southwestern Medical Foundation. Mr. Tichenor earned a B.A. with Honors in Plan II and an M.B.A. from The University of Texas at Austin, and an M.S. in biotechnology from The University of Texas at Dallas. Dr. Woodhouse became Chief Executive Officer and a member of our board of directors in September 2018 and has served as our Chief Financial Officer since March 2015. From 2002 to 2015, he was an investment banker at Goldman Sachs & Co. LLC, most recently as a Managing Director in the healthcare investment banking group and co-head of biotechnology investment banking. Earlier in his career, Dr. Woodhouse worked at Dynavax Technologies and also as a research assistant at Amgen, Inc. Dr. Woodhouse received a B.A. in pharmacology from the University of California, Santa Barbara, an M.B.A. from the Tuck School of Business at Dartmouth and a Ph.D. in molecular pharmacology from Stanford University School of Medicine. Dr. Brown is Paul J. Thomas Professor of Molecular Genetics and Director of the Erik Jonsson Center for Molecular Genetics at the University of Texas Southwestern Medical School in Dallas. Together with his long-time colleague, Dr. Joseph L. Goldstein, he discovered the low density lipoprotein (LDL) receptor, which controls the level of cholesterol in blood and in cells. They showed that mutations in this receptor cause Familial Hypercholesterolemia, a disorder that leads to premature heart attacks in one out of every 500 people in most populations. They have received many awards for this work, including the Nobel Prize for Medicine or Physiology (1985), the Albert D. Lasker Prize in Basic Medical Research (1985) and the U.S. National Medal of Science (1988). He is also a member of the National Academy of Sciences, the Institute of Medicine, Royal Society (London), the Association of American Physicians and the American Society for Clinical Investigation. Prof. Fischbach is an Associate Professor in the Department of Bioengineering at Stanford University. Prof. Fischbach is a leading expert in the identification and characterization of natural products from the human microbiome. He received his Ph.D. in chemistry from Harvard in 2007, and spent two years as an independent fellow at Massachusetts General Hospital before joining UCSF as an Assistant Professor in the Department of Bioengineering and Therapeutic Sciences in 2015. Prof. Fischbach is a recipient of the NIH Director’s Pioneer and New Innovator Award, an HHMI-Simons Faculty Scholars Award, a Fellowship for Science and Engineering from the David and Lucille Packard Foundation, a Medical Research Award from the W.M. Keck Foundation and the Young Investigator Grant for Probiotics Research from the Global Probiotics Council. Prof. Garcia is a Professor of Molecular and Cellular Physiology, and of Structural Biology at the Stanford University School of Medicine. He received his Ph.D. in biophysics from the Johns Hopkins University and completed post-doctoral work at Genentech and at the Scripps Research Institute before joining Stanford University in 1999. He was elected to the National Academy of Sciences in 2012 and is also an investigator with the Howard Hughes Medical Institute since 2005. Prof. Garcia is a leading scientist studying the structural biology of cytokine receptor recognition and activation, and probing cytokine signaling mechanisms using protein engineering. His research has identified new paradigms for recognition and activation of a variety of receptors that play critical roles in autoimmunity, cancer, neural growth and repair, and blood pressure regulation. Dr. Goldstein is Regental Professor and Chairman of the Department of Molecular Genetics at the University of Texas Southwestern Medical School in Dallas, and he also holds the Paul J. Thomas Chair in Medicine and the Julie and Louis A. Beecherl Distinguished Chair in Biomedical Science. He and his long-time colleague, Dr. Michael S. Brown, have worked together for the last 40 years on the genetics and regulation of cholesterol metabolism. Their discovery of the LDL receptor as the major molecule regulating cholesterol metabolism and its genetic disruption in the human disease Familial Hypercholesterolemia have been recognized by their receipt of numerous awards, including the Nobel Prize in Physiology or Medicine (1985), the Albert D. Lasker Award in Basic Medical Research (1985) and the U.S. National Medal of Science (1988). He is also a member of the National Academy of Sciences, Institute of Medicine, Royal Society (London), the Association of American Physicians and the American Philosophical Society. Prof. Schreiber is the Alumni Endowed Professor of Pathology and Immunology and Professor of Molecular Microbiology at Washington University School of Medicine in St. Louis. He is also co-leader of the Tumor Immunology Program of Washington University’s Siteman Comprehensive Cancer Center, Director of the Washington University Center for Human Immunology and Immunotherapy Programs and an Associate Director of the Scientific Advisory Council to the Cancer Research Institute. His career has focused on elucidating the biochemistry and molecular cell biology of cytokines and defining the role they play in promoting immune responses to cancer. Prof. Schreiber’s work has led to a generalized appreciation of the profound effect of immunity on developing tumors and has contributed critical conceptual and practical support to the fields of tumor immunology and cancer immunotherapy. Recently, he and his colleagues have pioneered the use of genomics approaches to define the antigenic targets of cancer immuneediting and elucidate the mechanisms that underlie the process. Prof. Schreiber was inducted into the American Academy of Arts and Sciences in 2010 and the National Academy of Sciences in 2013. For more than two decades, he was a Managing Director in MF Funds IV-X. During his tenure, he co-managed Mayfield’s health care initiative and helped establish the firm’s renowned franchise in health care. He continues his venture investing activities as an angel investor and advisor. Grant Heidrich was the past President of the Western Association of Venture Capital and former member of the Board of Directors of the National Venture Capital Association. Grant also served as Chairman of the Board of Tularik (NASDAQ: TLRK) until it was acquired by Amgen (NASDAQ: AMGN). During his venture career, he has been on the boards of more than 20 public and private companies. In 2009, Grant received the Lifetime Achievement Award from the National Venture Capital Association. He received his B.A. from Stanford University in the Department of Human Biology, and his M.B.A. from Columbia University. Prior to joining NGM in 2014, Mr. Jonker was the Senior Vice President, Corporate and Business Development at Theravance Biopharma (NASDAQ: TBPH) and held that same role at Theravance, Inc. (NASDAQ: THRX) prior to the spin-out of TBPH. He previously served as the Chief Business Officer of Satori Pharmaceuticals, the Vice President of Business Development and Corporate Strategy for Gloucester Pharmaceuticals prior to its acquisition by Celgene (NASDAQ: CELG) and leadership positions in the business development and legal groups at Genentech. Prior to Genentech, he was an associate in the Technology Transactions Group at Wilson, Sonsini, Goodrich & Rosati, representing clients in the life science and high tech industries. Mr. Jonker holds a J.D. from Columbia University School of Law, an M.LITT. from the University of St. Andrews and a B.A. from Claremont McKenna College. Dr. Levinson is currently the Chief Executive Officer of Calico and chairman of Apple, Inc. He previously served as Chief Executive Officer of Genentech from 1995 to 2009. Among his significant commitments are his memberships on the Board of Directors of the Broad Institute of the Massachusetts Institute of Technology and the Board of Scientific Consultants of Memorial Sloan-Kettering Cancer Center. Dr. Levinson also served on the Board of Directors of NGM Bio from 2009-2014. Dr. Levinson is the recipient of numerous awards and honors, including the Irvington Institute’s 1999 Corporate Leadership Award in Science, the National Breast Cancer Coalition’s Corporate Leadership Award, Institutional Investor’s Best Biotech CEO award (2004-2007), Princeton University’s James Madison Medal for a distinguished career in scientific research and in biotechnology, Barron’s designation as one of “The World’s Most Respected CEOs” and the Best Practice Institute’s “25 Top CEOs.” Dr. Levinson was elected a fellow to the American Academy of Arts & Sciences in 2008. NGM and Merck have an ongoing broad, multi-year strategic collaboration to discover, develop and commercialize novel biologic therapies across a wide range of therapeutic areas. Per the original agreement, announced in February 2015, Merck made a $94 million upfront payment to NGM and purchased $106 million of NGM’s preferred stock. 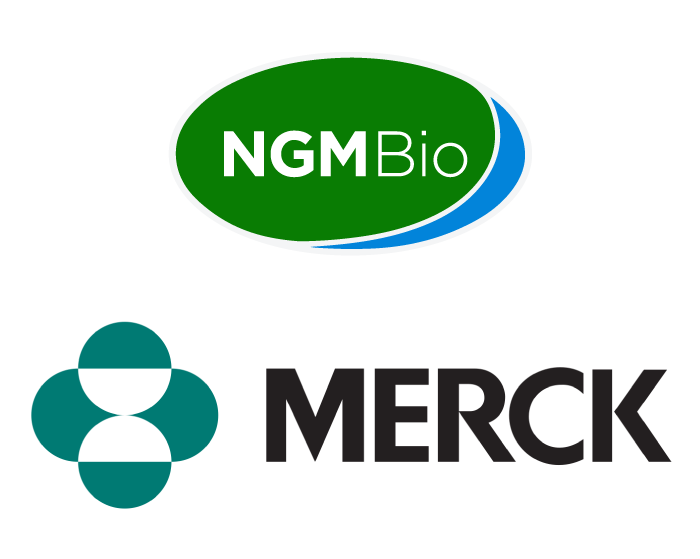 In addition, Merck committed up to $250 million to fund NGM’s research and development efforts under the initial five-year term of the collaboration, with the potential for additional funding if certain conditions are met. In March 2019, the companies announced that Merck exercised its option, under the terms of the original agreement, to extend the initial five-year research and early development phase of the collaboration for an additional two-year period from March 2020 to March 2022. During the two-year extension period, Merck will continue to fund NGM’s research and development efforts at similar levels to the original collaboration terms and will make additional payments totaling up to $20 million in support of NGM’s research and development activities in 2021 and 2022. Merck retains one additional two-year extension option that is exercisable in March 2021, which would extend the collaboration from March 2022 to March 2024. Merck has a one-time option to license all resulting collaboration programs following human proof of concept trials. Upon exercising such options, Merck will lead global product development and commercialization for the resulting products, if approved. Prior to Merck initiating a Phase 3 study for a licensed program, NGM may elect to either receive milestone and royalty payments or, in certain cases, to co-fund development and participate in a global cost and revenue share arrangement of up to 50%. The agreement also provides NGM with the option to participate in the co-promotion of any co-funded program in the United States. NGM’s fibroblast growth factor 19, or FGF19, program, including NGM282, is excluded from the agreement and remains wholly owned by NGM. NGM and Merck announced in January 2019 that Merck exercised its option to license NGM313, an investigational monoclonal antibody agonist of the β-Klotho/FGFR1c receptor complex for the treatment of nonalcoholic steatohepatitis (NASH) discovered by NGM. Merck’s one-time option to license NGM313 (now renamed MK-3655) was triggered by NGM’s completion of a proof-of-concept clinical study of NGM313. Merck intends to advance MK-3655 into a Phase 2b study to evaluate the effect of MK-3655 on liver histology and glucose control in NASH patients with or without diabetes.